Pack size: 1 x 30 capsules. Review Ocuvite Lutein I haven't used this on a regular basis - so don't really feel I can comment fully. Ocuvite Lutein I have taken these for years. Excellent product! Ocuvite Lutein The capsules are easy to swallow and don't taste badly. Great product! 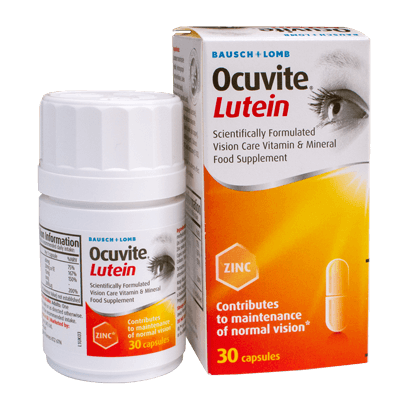 Ocuvite Lutein The supplement is easy to swallow and great if you don't have a lot of time to eat healthy and get the vitamins through your food. Ocuvite Lutein Great product and doesn't taste as weird as some other supplements! Ocuvite Lutein When I asked my optician about supplements I could take to care for my eyes, he recommended this one. I'm very satisfied with it. One of the most effective nutrients to maintaining eye health is Lutein, a protein which occurs naturally in the body and maintains the macula - the part of the eye which can degenerate with age, drastically limiting vision. So maintaining a good supply is essential. Regularly taking Lutein can prevent or slow the development of macular degeneration, one of the world's most common eye disorders. The Ocuvite Lutein pill also contains essential vitamins, A, C and E as well as Copper and Zinc - all beneficial for the eyes.